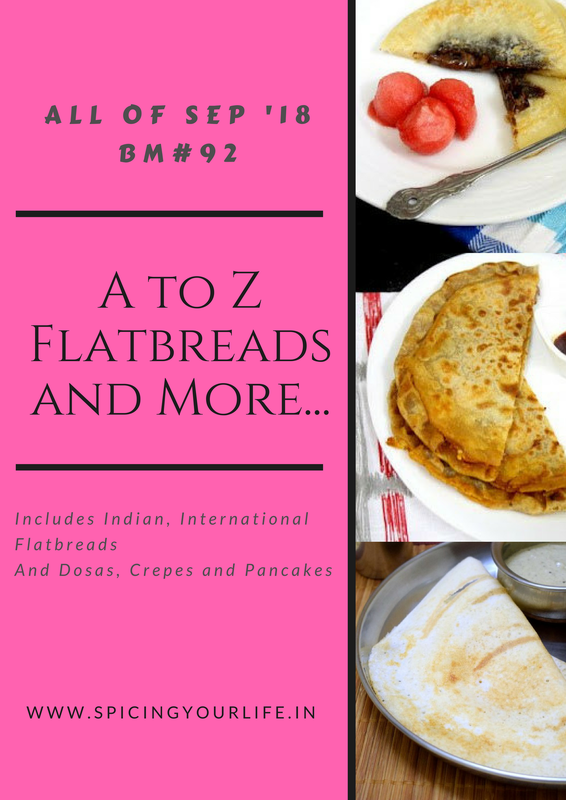 We in the letter Z and I have somehow completed this series of A-Z Indian flatbreads even though a bit late! For the letter Z, my choices were something with saffron so I can call it Zafrani but then made these Zucchini – Carrot Paratha Recipe instead. This year, during the summer vacation, we made the yearly trip to Ooty and I was surprised to see loads of Zucchini being sold on the road side and the price was not even 1/4 of what is sold here. I grabbed a kilo of this vegetable and asked for recipe ideas on Instagram did make most of them and one of the dishes I made was this Zucchini – Carrot Paratha Recipe/I also used the fresh and juicy carrots I picked along with Zuchhini . This was one of the first dishes that got done for this event! Take whole wheat flour, salt, grated zucchini, grated carrot, kalonji,salt and turmeric powder in a bowl and mix well.Add water little by little and knead to a smooth and non sticky dough .Add a little oil and knead a few more times. Roll out a small ball of dough and roll out into a circle. Cook on a heated tawa / griddle till brown spots appear on both sides, Remove from tawa. Repeat for the remaining dough. My kids were ready for zucchini paratha as well but last minute inspiration struck and shifted to zafrani paratha. 🙂 What a fantastic series it has been, PJ. Glad to be running it along side you. Kudos to all your innovative posts now and always. Both Zucchini and Carrots must have made a wonderful paratha . Ideal for the fussy kids . I also like the use of kalonji it gives a delicious flavour to the paratha . Some of the parathas that you have posted are very unique , very different and very very impressive . Must say you have rocked with flying colours ! Kudos PJ ! Excellent way to sneak zucchini this way PJ, my kids just love zucchini and carrot in parathas, its quite an interesting combo for parathas na. And you have done a fabulous job with all your beautiful flatbreads.. Kudos to u.
Zucchini paratha is really healthy and tasty version of eating healthy veggies in meal. Adding the veggies in the dough itself makes it more colourful and really nutritious. It is also easy to feed kids without any fuss. This month had been wonderful with all the interesting paratha from you PJ. That’s a wonderful way to include the vegetable into the dough, makes rolling out so easy. I am so glad you managed to complete the series with some gems that I would surely want to try…great series. Sometimes I have a bit of zucchini left over and have no idea how to use it as it may not be enough for another recipe. Adding it parathas is a good idea. Also makes them soft and delicious too. Lovely recipe Padmajha. Enjoyed the flatbreads you made for this Mega BM and has bookmarked a few. awesome PJ, I love the addition of carrot in zucchini paratha. must have brought flavors to paratha. Loved this platter. That is a healthy paratha using zucchini and carrot. The kids would love this for their lunch boxes. Zucchini and carrot in the parathas is interesting. I make then but either zucchini or carrot. Will try to combine as you have said as it looks delicious.